Alexandra Robbins is a best-selling author and award-winning journalist. In her latest endeavor, The Nurses: A Year of Secrets, Drama, and Miracles with the Heroes of the Hospital, she ventured in to the world of the nursing profession where she spent a year with the heroes behind the hospital curtain. Robbins follows four nurses for a year while they explored their own personal lives, challenges, and careers in various hospitals in a metropolis. The names and details have been changed to protect the innocent. It could be any city in America. Most of the drama takes place in the ER. The four nurses are friends who take different paths as they struggle to find the perfect place to practice their skills and talents while they share their passion for helping patients overcome a wild variety of situations. The nurses deal with personal demons, violent patients, doctors who bully them and doubt their knowledge and skill, and hospital environments that allow, and in some cases, encourage these situations to thrive. While the book delves into the personal lives as well as their professional struggles and successes; it's all something every nurse can relate to including friends, family and especially significant others who don't understand that healthcare is 24/7 every day despite holidays, weekends, birthdays and funerals. How do nurses juggle precious personal relationships and meet the needs and demands of their patients when battling all of the uphill forces thrown at them from politics, financial greed, and egos? It takes a lot of courage, strength and perseverance, but nurses know no one ever said nursing would be an easy job. 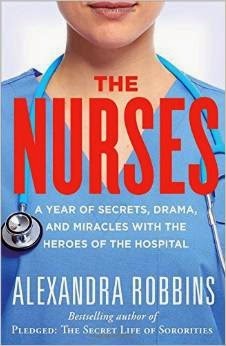 Robbins captures the true essence of the nursing profession and all the good and bad. It's a page-turner because you keep rooting for the four nurses to win and find the Holy Grail of employers. It's a great book for any nurse struggling to find her own answers and feeling like she is the only one fighting so hard. It's a great book for anyone new to nursing to understand that he needs to hang on to every ounce of optimism he gained in nursing school and all the confidence he had before starting that first day as a licensed nurse. Anyone thinking about being a nurse might be scared off, but then again, if they have the passion, drive, and tenacity they will need to get through nursing school, it should only fuel their fire to help to make a better world for nurses in the future. It should be a must-read for every administrator, physician and all ER personnel! Nurses will feel a renewed sense of passion to make healthcare a better place for everyone.